We go through tupperware like a baby goes through diapers. Maybe not quite that fast, but sometimes it feels like I’m constantly buying new ones. The dogs chew the lids. They start to leak food. Tomato sauce turns it from clear to red. The lids go missing. I’m half convinced I’m going to find 10 missing tupperware lids with all the dozens of socks I can’t find. And I’ve tried them all. The heavy duty Pyrex glass Tupperware? Great, except those are my dogs favorite to chew. I guess I should be grateful, they leave my shoes alone. Rubbermaid? Again, dogs like to chew those ones. And the lids go missing a lot for some reason. I bought a 42-piece set last year – I’m down to 3. Glad Tupperware? I bought a set of 4 a couple months ago. I have 2 left. Of those 2, both are stained red from tomato sauce. So when I got the Black+Blum Box Appetit, I figured it would go down like the rest. But this Tupperware is made to last. I’ve never seen a Tupperware container made from this material before, so I had to look it up. It’s BPA-free made of polypropylene and copolyster. I have no idea what those are, but it’s not a cheap plastic. It’s tupperware. If you can’t heat it up in the microwave and put it in the dishwasher after, you’re doing it wrong. Black + Blum is fine in both. Here’s my big thing about Tupperware. I send my husband to work with leftovers. And 5 days later, I get 3-4 of them brought back to the kitchen. All of them filled with the remaining pieces of food clinging to the sides of the Tupperware. It smells. It’s moldy. It’s disgusting. I threw one away because I didn’t dare to open it. This isn’t really the Tupperware’s fault, it’s my husband for not cleaning it. He thinks it’s too difficult to clean it out and gives it to his wife. Hmph. But I wanted him to test out the Black+Blum box appetit too. So I sent him to work with leftover ribs. I expected him to bring back a stained Tupperware container with sauce and rib bones inside. Instead, I got a clean non-stained version back. How? My husband cleaned it. He actually cleaned it. I checked his temperature, he wasn’t running a fever. He was curious, and he tried cleaning it himself. It was so easy to clean, I got a clean Tupperware dish back. This has never happened before. The downside? My husband thinks every Tupperware is easy to clean. Hah! Great tupperware for your lunch! Here’s the real test. I wanted to know whether all the sauces would come spilling out of it like what happened with a different Tupperware container that destroyed a backpack. I let my husband try it. He put it in his backpack without a plastic bag protection. No leak. This Tupperware has 2 secure lock-down clips on the side. They actually take a little extra muscle to close sometimes. My husband didn’t have a problem, but I did. But I’ll take the extra effort for the security that I won’t be buying new bags to replace the sauce-damaged ones. The Black+Blum container comes with a sauce pot and inner dish, so if you didn’t want your rice to get soaked in sauce for hours ahead of time, you can actually separate it. Makes for a really nice lunch. I had no idea what this extra flap was for, until I looked it up. It’s a steam release valve. If you prepare hot food – instead of all the water building up inside the Tupperware, you can let out the extra moisture. It’s 880 ml / 30 fl oz. My best explanation: it’s the size you want your lunch to be. The bigger Tupperware containers trick you into eating too much. The smaller containers are snacks. This is like in ‘Goldilocks and the Three Bears’: Just right. 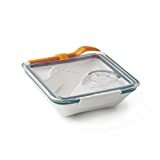 Great Tupperware container that will secure your sauce and is easy to clean. It may be a little more expensive than the cheap Tupperware containers. But you get what you pay for. I’d rather buy one good one than keep going through Tupperware that is easily damaged, or that damages my bag. Oh, and if you were curious. My dogs did try to chew this one. They failed. Hopefully they don’t move on to my shoes.